With regard to the environment, things have deteriorated over the last few decades: loss of species, habitat, and biodiversity are increasing in most parts of the world, and the global temperature is rising. According to the philosopher Arne Johan Vetlesen, when it comes to nature, there is a blind spot in the Western philosophical tradition. This lack of discourse is, though not a direct cause, at least a symptom. 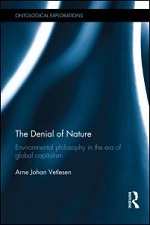 In The Denial of Nature, the Vetlesen questions whether and why this is so. The book marks a shift in the works written by Vetlesen: «As a philosopher I came late to the present topic» (4). Thus, one might say that the book illuminates a blind spot in the philosopher´s own professional career. This link between the development of the philosophical discourse on nature, and the author´s own awakening to the same topic, is a driving force in the text. The premise of the book is that «philosophy is an activity deeply entrenched in the patterns of contemporary culture; for good and bad, it mirrors and helps reproduce those patterns both in thought and in practice» (2). According to Vetlesen, contemporary culture is fully anthropocentric; human values permeate both the way life is lived and the intellectual life; they shape our identity and our place in the world. From this perspective, humans have the position and the right to make use of nature. We do not see this anthropocentric culture because we are totally immersed in it. Scientific knowledge has informed us about climate change and environmental challenges. Why is it then, in our post Enlightenment era, that we do not take seriously the consequences of this knowledge about the exploitation of nature and the warming of the climate? This paradox has to do with the anthropocentric culture. Vetlesen claims that, in order to make a difference in the real world, «a shift must be made from theorizing nature to experiencing nature» (2). Nevertheless, the aim of the book is theorizing, since it challenges canonized philosophical texts on the nature issue, and presents examples of less well-known philosophers who discuss and contribute to environmental thinking. Of special interest for the NaChiLit group is Vetlesen´s discussion of Descartes, Kant, and the «Nature deficit in critical theory» (chapter 2), the Frankfurt School (Horkheimer and Adorno), and Habermas. His claim is that the concept of rationality worked out by Habermas in The Theory of Communicative Action (1981), which was highly relevant for modernity and democracy, is an example of how this anthropocentric position make humans the unquestionably ruler of all life on earth, at the same time devaluating all other species and lifeforms. Then, in «Philosophizing value in nature» (chapter 3) Vetlesen presents philosophers who have the potential to guide us to the view that «value is intrinsic in nature» (96): Paul W. Taylor, J. Baird Callicott, Holmes Rolston and Hans Jonas. In spite of this discussion being linked to the topic of Interspecies ethics (title by Cynthia Willett, see earlier book report), there are hardly any cross references between the two books. Vetlesen argues that our understanding of nature also rules our inner nature, the way we understand ourselves. We tend to think about nature and human capital in the same exploitative way. The author urges us to search for another kind of language, with a new kind of confidence in our own experiences and feelings. This we see in practice in the way Vetlesen brings his own life into the debate: «Spending a day in the woods recently, two experiences stood out» (147). Here is an argument for the role of literature and educational practices in the environmental discourse.